You want to build up on your bachelor studies and gain hands-on knowledge at the intersection between business and technology? You want to acquire scientifically proven methods and apply them to topics such as Big Data, Business Intelligence, Analytics and Business Process Management? You want to study an accredited (FIBAA), full-time English master’s program with a small group of international, smart and motivated students in the heart of Germany’s capital Berlin. You want to be well prepared for your next career step e.g. as a Data Scientist or Business Process Consultant? The information session lasts one hour and is conducted by the academic directors of the program. You will have the opportunity to learn more about the curriculum, didactical principles, requirements for admission and other topics concerning the Business Intelligence and Process Management (BIPM) master’s program. You will also have the chance to ask your questions directly to the academic directors. For those of you who can’t wait to see which projects our students are conducting, check out our blog. If you have any questions regarding your attendance to the information session, please contact our program office at +49 (0)30-30877-1563. Your contact person is Mrs. Jäkel. I missed out on this Info Session. Please are you able to share any information on program. I have keen interest in this career area and would like to know more about this session. 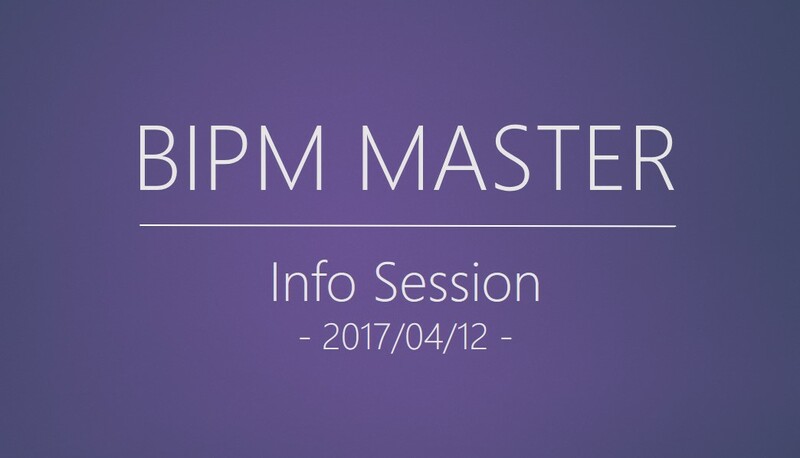 – http://www.master-bipm.de/bipm-courses/ > Overview of all the core courses. – http://www.master-bipm.de/bipm-career/ > Overview of typical career paths. For specific questions, please contact us. We’ll try our best to answer them.